All Diving Agencies, have rules on training, called Standards. One of the key parts of diver training, or indeed a diver experience involves some “Confined Water” training. In The PADI Instructor Manual, Confined water is defined as “Swimming pool-like conditions with respect to clarity, calmness, and depth”. Unfortunately it is very rare that the sea in Limassol can be considered to be Swimming Pool-Like Conditions!! At a depth where you can kneel down to learn skills and just stand up if you have a problem, the sand here is very fine and will limit visibility. Plus most days the sea is not as calm as a swimming pool, unless its at 6am!!! But who wants to get up at that time of the day! 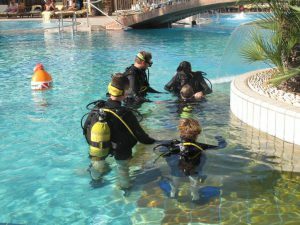 Therefore unlike some other Dive Centres, Dive In ONLY teaches Confined Water in the swimming pool, for comfort and safety, as well as to adhere to this PADI Standard. So, when looking for a Dive Centre, do ask where your confined Water will be conducted, obviously, by going straight into the sea, its more stressful, cuts corners, breaks diving Standards, if its not swimming pool-like conditions, and is probably why the diving is cheaper!! !